Apple Arcade will be a monthly subscription service for a series of curated games. It will feature over 100 games at launch, with new games added regularly. A single Arcade subscription buys full access to all Arcade games, none of which have ads. Arcade games will work across iOS, macOS and tvOS, and game state is maintained across different devices. The service will feature games from Annapurna Interactive, Bossa Studios, Cartoon Network, Finji, Giant Squid, Klei Entertainment, Konami, LEGO, Mistwalker Corporation, SEGA, Snowman, ustwo games and dozens more. Apple Arcade will launch in fall 2019 in more than 150 countries from a new tab on the App Store. Pricing was not announced. Apple issued a statement today responding to Spotify's claims of unfair competition because Apple takes 30% of in-app purchase revenue, affecting products like a Spotify Premium subscription. In fact, Apple takes only a 15% cut after the first year of each annual subscription. Apple today announced that its next annual developer conference will take place June 3-7, 2019 in San Jose. 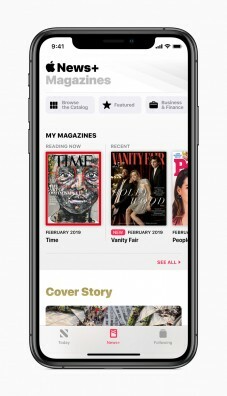 The company usually reveals details of a new version of its iOS software during the keynote presentation on the first day of the event. Apple takes a 30% cut of all iOS in-app purchases for digital products and services (but not physical ones). This includes products like a Spotify Premium subscription. Spotify argues that it cannot offer pricing competitive with Apple Music when they have to pay the 30% but Apple does not. Spotify and similar companies can accept payments via other means, but Apple then prevents them from emailing their own customers about updates, etc. Spotify has taken their argument to the European Commission, asking them to rule that these practices constitute unfair competition. Apple and Goldman Sachs are working together on an Apple MasterCard credit card that would integrate with Apple Pay and offer 2% cash back. 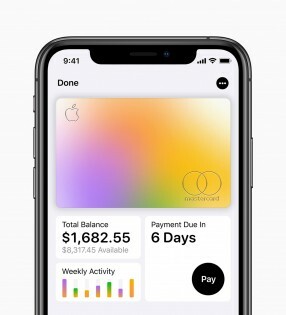 The Wall Street Journal reports that the card would offer unique software features in iPhones, such as setting spending goals, tracking rewards and managing balances from within Apple's Wallet app. Goldman has never offered a credit card before, and is spending $200 million to build the infrastructure to support the new card. The product is about to enter testing with Apple employees. The companies plan to launch it for consumers later this year. 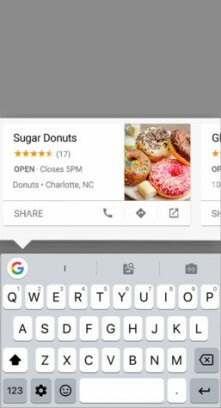 Google's newest version of Gboard — its keyboard-replacement app for iOS — adds physical feedback when typing. Apple's own iOS keyboard does not offer this popular feature. The haptic feedback feature is available on iPhone 7 and later. Gboard also offers input by word swipe and voice. It includes emoji (with search), GIFs, stickers, and personalized stickers. Google search is built-in and results — such as business listings, videos, images, and articles — can easily be pasted and sent to others. The new version is 1.4 and is available now in the Apple App Store. A massive bug in Apple's new Group FaceTime feature allowed callers to listen in on people before they answered an incoming FaceTime call, and in some cases even see live video. Apple has already moved to prevent the issue from affecting users by turning off the Group FaceTime feature altogether, for all users, apparently with a change to its cloud systems. Before Apple acted, anyone running iOS 12.1 could exploit the bug by initiating a FaceTime video call to their target, then making it a Group FaceTime by adding their own phone number to the call. The caller would then receive audio from the other end, and if the callee pressed the power button to dismiss the incoming call, it would instead trigger live video to be sent to the caller. The issue also affected FaceTime on MacOS. Apple has acknowledged the bug and promised a software update to fix it this next week. Apple Pay and Google Pay are closer to being accepted everywhere, with the announcement that Target, Taco Bell, Jack in the Box, Hy-Vee and Speedway are now rolling out support for NFC payments. 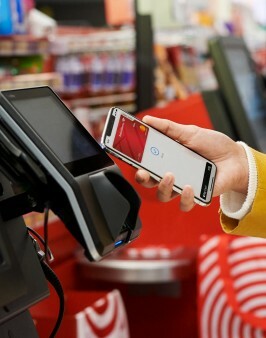 Target was one of the last big holdouts in supporting the technology, which lets you simply tap your NFC-equipped phone or smartwatch on the card terminal to pay. Target expects its rollout to all 1,850 locations across the US to be complete in the "coming weeks". Taco Bell and Jack in the Box expect to finish their rollout in the "next few months". Previous holdouts CVS, 7-Eleven, and Costco launched support for NFC payments last year. A new group video chat app called Squad lets users share what's on their screen, including other apps, in addition to traditional video chat. It's currently available for iOS; an Android version is in internal beta. The Android version also supports picture-in-picture, for sharing both a live selfie and screen sharing at the same time. Squad is designed to let users turn any app, including social media apps, into a shared social experience. In beta testing, users also found it useful for tech help, homework help, and coordinating dining and travel plans. Verizon's top two unlimited postpaid plans now include an Apple Music subscription. The most affordable plan, GoUnlimited, still includes just a six-month trial of Apple Music, as the other plans did previously. 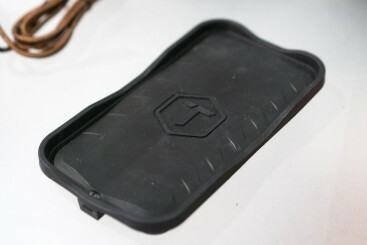 ToughTested has a new Qi wireless charging pad designed primarily for cars. Its grippy all-rubber construction ensures it stays put, and that your phone stays put while charging. It supports wireless fast charging up to 10W, including Apple's 7.5W fast charging mode for iPhones. It's large enough to accommodate the largest phones, but designed so that a phone placed anywhere in the tray will charge; no centering needed. It has foreign object detection and is Qi-certified to ensure it won't overheat the phone. It includes a Quick Charge power supply that plugs into a car's 12V power port. It will go on sale in March for about $50. Read on for photos and first impressions. Do you ever wish your iPhone had a notification light? Do you use the LED flash to notify you of incoming calls, but wish it weren't blindingly bright? Iconcase is an attractive new case for iPhones that adds a large notification light to the back. The newest model charges by sipping a little juice whenever the iPhone is wirelessly charging through the case, so you never have to worry about charging it. It communicates with the iPhone via standards built in to Bluetooth LE, so you only need to pair it; no special app or setting is required. 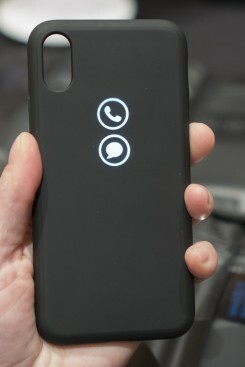 The standard model includes one light-up icon for incoming calls and second for messages. The company is also working on a range of cases with fixed full-color designs that light up, and a skull design with eyes that light up red. The company says they are close to a deal to sell the cases through Apple's online store in the US. Pricing has yet to be determined, but is expected to be roughly $50. Read on for our hands-on impressions and photos. You may soon be able to send or receive in-app content from the App Store as a gift. Apple recently updated the App Store Review Guidelines and therein gave developers new powers to entice users. The relevant language in the new Guideline says, "Apps may enable gifting of items that are eligible for in-app purchase to others. Such gifts may only be refunded to the original purchaser and may not be exchanged." Apple did not spell out how developers should implement this feature, nor did it explain how the feature will work for end users. Before this change, it was only possible for people to gift apps to one another and not the content within. Apple's iPhones continue to infringe on Qualcomm patents even after a recent software update pushed by the company, according to Qualcomm. "Despite Apple's efforts to downplay the significance of the order and its claims of various ways it will address the infringement, Apple apparently continues to flout the legal system by violating the injunctions," said Qualcomm in a statement provided to Reuters. Earlier this month, Apple was found to be violating Qualcomm intellectual property. The Chinese judicial system, in a court order, banned Apple from importing its devices into China, though Apple later suggested a software update would resolve the issue. The update was pushed last week. "Apple's statements following the issuance of the preliminary injunction have been deliberate attempts to obfuscate and misdirect," continued Qualcomm. "They are legally obligated to immediately cease sales, offers for sale and importation of the devices identified in the orders and to prove compliance in court." Apple believes it is complying with the court order and continues to offer its devices for sale in China. Apple and Qualcomm have been locked in a battle over patents and licensing costs for several years. Apple today made iOS 12.1.2 available to iPhones and iPads. The update targets several bugs related to eSIM activation on the iPhone XR, XS, and XS Max. It also addresses an issue that could affect cellular connectivity in some markets on those same phones. iOS 12.1.2 is free to download over the air. T-Mobile today said owners of the Apple iPhone XR, XS, and XS Max can now take advantage of the embedded eSIM. T-Mobile is allowing unlocked variants of these iPhones to access prepaid T-Mobile service as a secondary line. In order to do so, people will need to download the (free) T-Mobile eSIM app from the iTunes App Store and use it to initiate prepaid service. T-Mobile says its support of the iPhone eSIM is intended for those who travel to the U.S., for existing T-Mobile customers who need a secondary line on their device, and for those who wish to take T-Mobile’s service for a spin before making a longer commitment. T-Mobile will continue to require physical SIM cards for primary lines and family plans. AT&T and Verizon's method for activating the eSIM requires users to visit a store or use a scannable QR code sent via the carrier. Sprint is not likely to support the eSIM until 2019. Apple plans to issue a software patch to its iPhones to appease Qualcomm and Chinese authorities. Earlier this week, a Chinese court found Apple to be in violation of two Qualcomm patents pertaining to resizing pictures and managing apps with a touch screen. The court issued a ban against Apple, blocking it from importing a range of phones into China. Though Apple is appealing that decision, it claims it can mitigate the issue via software. "Based on the iPhone models we offer today in China, we believe we are in compliance," said Apple in a statement provided to Reuters. Even so, the company went on to say, "Early next week we will deliver a software update for iPhone users in China addressing the minor functionality of the two patents at issue in the case." Apple didn't provide details concerning how the update will resolve the issue. As part of its appeal to the Chinese court, Apple said any ban would impact Chinese suppliers, Chinese consumers, and tax revenue it pays to Chinese authorities. Though the ruling called for an immediate ban, Apple's devices still remain available for sale in China. The patent spat between Apple and Qualcomm is part of a global battle over patent licensing practices and royalty payments. Qualcomm is seeking to add the iPhone XR and iPhone XS to the list of devices banned from import into China. Qualcomm won a patent-related victory earlier this week when a Chinese court agreed that Apple violated a Qualcomm patent. The Chinese court banned infringing devices (iPhone 6s/Plus, iPhone 7/Plus, iPhone 8/Plus, and iPhone X) from entering the country. Though that ban has yet to go into effect, Qualcomm wants Apple's newest phones also kept out of the country. Earlier this week Apple said all its devices remain available for sale in China, despite the ruling. Qualcomm and Apple have ongoing patent-related legal skirmishes taking place in courts around the globe. Apple today announced plans to build a new campus in Austin and expand its presence in a wide range of other markets with new hires. The company will invest $1 billion in the Austin campus, which entails a 133-acre site capable of handling up to 15,000 employees. Apple claims that once the Austin site is fully staffed, it will make Apple the largest private employer in Texas. The Austin campus will include engineering, R&D, operations, finance, sales, and customer support jobs. Apple already has 6,200 employees at its existing Austin facility. Apple said it will establish new sites in Culver City, Seattle, and San Diego. Existing Apple sites in Boston, Boulder, New York, Pittsburgh, and Portland, Ore., will add an unspecified number of jobs over the next three years. Apple claims it added 6,000 jobs in the U.S. during 2018 and now employs 90,000 people in all 50 states. Apple said it is on track to create 20,000 jobs in the U.S. by 2023. The company plans to invest $10 billion in U.S. data centers over the next five years, and expand data centers in Arizona, Nevada, and N. Carolina. The newest data center is being prepared for Waukee, Ida. "Apple is proud to bring new investment, jobs and opportunity to cities across the United States," said Apple CEO Tim Cook. "Talent, creativity and tomorrow's breakthrough ideas aren't limited by region or zip code." The U.S. International Trade Commission plans to review an earlier ruling that found Apple guilty of infringing on a Qualcomm patent, but did not seek to ban iPhone imports. In September, an administrative law judge determined that Apple violated one of three Qualcomm patents pertaining to how smartphones perform without consuming too much power. Qualcomm had asked the ITC to ban Apple from importing the infringing iPhones into the U.S., but the law judge said such a ban was not in the U.S. interest. Now, the full ITC panel will review the earlier decision to determine what steps to take. Qualcomm said it was pleased to see its lawsuit take another step forward. The two companies are battling one another in courts around the world over patents and royalties, with each company seeings wins and losses. Earlier this week, Qualcomm won a case against Apple in China that may see iPhones banned from the People's Republic. Qualcomm today said that a Chinese court has granted two preliminary injunctions against Apple subsidiaries. The ruling orders the subsidiaries to "immediately cease infringing upon two Qualcomm patents through the unlicensed importation, sale and offers for sale in China of the iPhone 6S, iPhone 6S Plus, iPhone 7, iPhone 7 Plus, iPhone 8, iPhone 8 Plus, and iPhone X." Qualcomm alleges that Apple is violating two of its patents, which let people resize and reformat pictures, and to view, navigate, and dismiss apps using a touch screen. Qualcomm says the patents were previously upheld as valid by the Chinese patent office. Qualcomm is seeking similar relief for other patents that it claims Apple is violating in China and other markets. Qualcomm and Apple have been locked in a bitter patent-related feud for nearly two years. Though today's preliminary ruling calls for "immediate" action, it's not clear how soon any sort of ban might actually begin. Apple did not immediately comment on the matter. Apple said owners of the Apple Watch can expect to see watchOS 5.1.2 arrive later today. This update targets the new Series 4 smartwatch and introduces features Apple first revealed earlier this year. 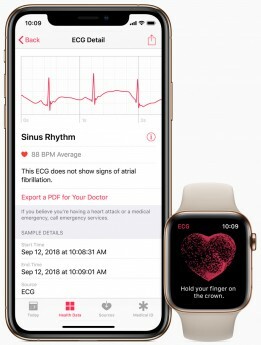 The Series 4 gains an ECG app, which gives people the ability to take an electrocardiogram (ECG). Electrodes built into the back of the Digital Crown support the feature. Watch owners need only launch the app and press and hold the Digital Crown for 30 seconds. In addition to taking the ECG, the app also looks for irregular heart rhythms. The Watch is specifically looking for signs of atrial fibrillation, which is a warning sign of imminent health events such as a stroke. Apple worked with the FDA for years in order make this possible. The results are stored securely in the Health app on the associated iPhone and can be shard in PDF form with health care providers. All Apple Watches gain access to an improved heart rhythm detector. The detector uses the optical heart sensor on the Watch to check the rhythm occasionally. If it detects any abnormalities, it will alert the wearer. 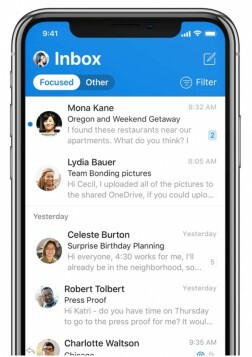 This feature was validated by testing hundreds of people. Apple says these new tools will need to be turned on. An onscreen setup flow teaches Apple Watch owners what the features can do, what they cannot do, what types of results they may get, and how to interpret those results and take action if warranted. watchOS 5.1.2 will be available for download today. Amazon today said Apple Music subscribers will soon be able to enjoy their playlists through Alexa-powered devices. Apple Music customers can request that Alexa play songs, artists, albums, and Apple playlists, as well as stream Apple Music radio stations. For example, people can say "Alexa, play Beats 1" to hear Apple's global radio stream. In order to pair Apple Music with Amazon Alexa, customers will need to enable the Apple Music skill in the Alexa app. "Music is one of the most popular features on Alexa — since we launched Alexa four years ago, customers are listening to more music in their homes than ever before," said Dave Limp, senior vice president, Amazon Devices in a blog post. "We are committed to offering great music providers to our customers and we're thrilled to bring Apple Music — one of the most popular music services in the U.S. — to Echo customers this holiday." Amazon says Alexa owners stream tens of millions of hours of radio each month, and have set tens of millions of music alarms in the last year. Apple Music comes to Amazon Alexa and Echo on December 17. Before this announcement, Apple Music was only available to Apple's own HomePod speaker. Google today renamed its MVNO, Project Fi, to Google Fi. Along with the name change comes dramatically expanded compatibility with phones. Moving forward, the service will work with most Android phones as well as the Apple iPhone. The process of activating Fi on Android devices will be straightforward. Google says compatibility with iPhones is in beta and will require people to jump through a few more hoops, including the use of an iOS app. Basic service will be available to the majority of devices. Fi operates on T-Mobile, Sprint, U.S. Cellular, and WiFi, dynamically jumping to the strongest connection. Subscribers will need specific phones, listed on the Fi web site, to get this benefit, as proper LTE support is required. Google recently added VPN protection to Fi. The base service costs $20 per month for unlimited voice and text. Google charges $10 per gigabyte of data. People interested in the service will need to order SIM cards from the Google Fi web site. The service does not require contracts.